InterDynamics » FAQ » FAID General » How does FAID work? FAID makes provision for the user to enter and compare results of multiple ID’s (representing either individuals, groups, or shift patterns) across two work schedules (sometimes used to compare Planned and Actual data). 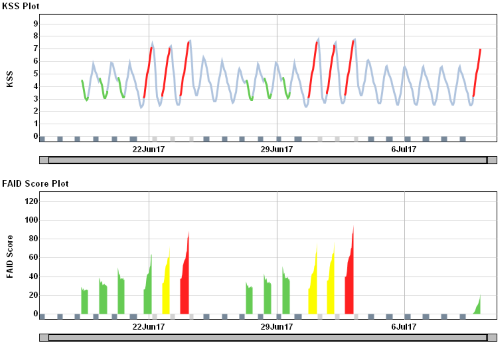 Results for Hours worked when exceeding the set FAID Score Tolerance Level (FTL), KSS Tolerance Level (KTL), Peak FAID Scores, Peak KSS and more, are determined and presented both graphically and in tabular form, together with summary distribution of results.